Dr. Andrew K. Lee has been practicing in the greater Houston area for more than 17 years and is considered a veteran and expert in his field. Dr. Lee is double Board Certified in Orthopedic Surgery and has added qualifications in Surgery of the Hand. He received his Bachelor of Science degree from the University of California at Los Angeles in 1988 and earned his Doctorate of Medicine at Howard University, Washington D.C. in 1992. He completed his residency in Orthopedic Surgery at Howard University Hospital in 1997 and received training at George Washington University affiliated hospitals. Dr. Lee completed his fellowship in Hand Surgery at The Hand Surgery Centers of Texas and his Microvascular training at Baylor College of Medicine. He received numerous academic accolades including Maimonedes Scholar’s Award for outstanding leadership in residency. 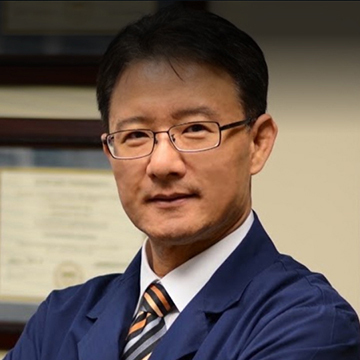 Dr. Lee has extensive experience in both hand and orthopedic surgery with an expertise in arthroscopy. He is the reviewer for the Journal of Hand and Microvascular Surgery and has authored many hand and orthopedic publications. His latest work with endoscopic decompression for peripheral nerves was published is the Journal of Hand Surgery and he is considered a pioneer in this field. He is an active member of American Society for Surgery of the Hand and fellow of American Academy of Orthopedic Surgeons. Dr. Lee is an accomplished surgeon, musician, and has devoted much of his time over the years to medical missionary work abroad.